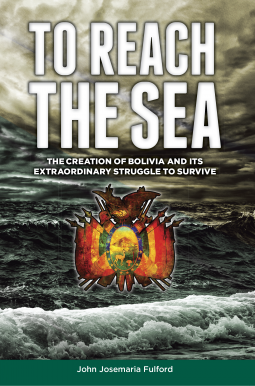 To Reach the Sea: The Creation of Bolivia and Its Extraordinary Struggle to Survive by John Josemaria Fulford is a study of Latin America’s least known country. Fulford has hitchhiked through every country in the Western Hemisphere, worked at many occupations, taught school grades K-12 and college, John delivers his memories in books that are both memoir and detailed travel accounts, some of the worlds no longer in exist. His thirst for knowledge led to a thirty-year project deciphering Webster’s Dictionary to find the rules Noah Webster held in his head when he codified American English two hundred years ago. It has been two decades since I sat through Latin American history as an undergraduate and almost as long since I did it as a grad student. The history is unique and interesting. From colonization to independence and from dictatorships to democracy Latin America had and has promise but tends to be held back by their own doings and interference from the outside. It is unique from North America where the idea of self-government was built on English tradition. Here native people mixed, and intermixed, with Spanish settlers trying to establish their own identity, governments, and democracy in vaguely defined borders without the experience of self-government on any level. It was not an easy transition. Economically some countries were better than others, notably Argentina, Brazil, and Chile. Others were trampled over and held back, notably Bolivia. Bolivia takes its name from the liberator Simon Bolivar, It was part of the Inca Empire and during colonization, it was referred to as Upper Peru. The Spanish were better conquerors and looters than administrators. Regional borders remained mostly undefined. It really didn’t matter because it was all Spain, except for Brazil. In North America, people defined themselves by their states, so Virginia had a definite meaning to its inhabitants and to the charter companies. In Spanish America, more concern was on where you were from. A hierarchy was developed: Peninsulares (Those born in Spain), Criollos (Whites born in the Americas), Indios, and Mestizos (Mixed race, originally viewed as illegitimate). Priorities were different between North and South during colonization. Fulford gives a detailed and well-researched history of Bolivia, but it also places Bolivia in South American history. Bolivia is a product of its neighbors. Through poor leaders and aggressive neighbors, Bolivia lost territory and access to the Pacific and at times access to the Atlantic. Landlocked and trapped between powerful countries, Bolivia struggled just to survive. Rich mineral deposits have not lead to prosperity. Bolivia ranks 96th in GDP compared the Chile at 42 Argentina at 21, and Brazil at 9. To Reach the Sea is a detailed and very readable history of South America’s least known country.